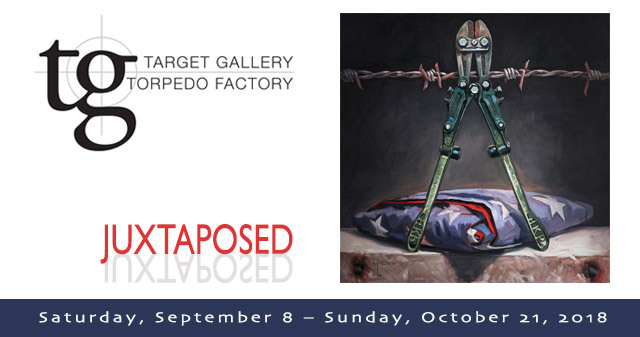 I’m very happy to have work included in Target Gallery’s upcoming “Juxtaposed” exhibition. Saturday, September 8 – Wednesday, October 21. Target Gallery’s “Juxtaposed” is a group exhibition focusing on the contradictory or conflicting. Whether it be through the use of mixed media or the themes represented, the work itself should be at odds with two or more juxtaposing concepts. Target Gallery is the contemporary exhibition space for the Torpedo Factory Art Center. They host eight exhibitions annually featuring a variety of themes, artists, and media focused on the latest trends in contemporary art. Located in Alexandria, Virginia, the Torpedo Factory Art Center was founded in 1974 in an old munitions plant and is home to the nation’s largest collection of working-artists’ open studios under one roof. The newest group exhibition in Target Gallery, the contemporary exhibition space for the Torpedo Factory Art Center, investigates opposing or conflicting themes through art. Juxtaposed is on view Saturday, September 8 through Sunday, October 21, 2018. The exhibition features 25 artworks by 12 artists from all over the country. In the language of art and art history ‘juxtaposed’ is a significant word. Any student of art history learns very early on that placing two artworks next to each other can open up incredible ways of thinking and allow us to notice things that we might not have before. Juxtaposing helps to define certain elements, ideas, and styles. Juxtaposed works can reveal otherwise subtle or hidden meanings. Yet the definition of the word juxtapose is a surprisingly simple one. The Merriam-Webster dictionary defines juxtapose as “to place (different things) side by side (as to compare or contrast them or to create an interesting effect).” That’s it. To place things side by side. What can we learn when we place one thing next to another? The works in this exhibition encompass the subtlety and complexity that can unfold from the simple act of “placing side by side.” Whether it be a literal placement of two disparate visual elements side by side as in the case of Megan White and Nora Burghardt’s Topos series, or Pam Rogers’s Rescue and Contiguous; or the juxtaposition of tone between the visual and the content as in Caroline Wayne’s Pretty Real series, Miranda Brandon’s Erasure, or Theresa Divine’s ‘Til Disability Do Us Part & In Sickness And In Health, these works present a juxtaposition that gives us pause, allows us to access difficult content, and dig into the more complicated meanings at hand. Many of the works in this exhibition use juxtaposition to present hard truths with which we must grapple. In Ryan Lewis’s and Travis Donovan’s works, for example, juxtaposed elements call attention to identity, and how easily (or not easily) one fits within the structures of our society. Society, and a reminder of the structures of power that continue to plague it, are also on display in Nadia Estela’s Vis Insita and Lex Insita. Lyle Rushing, Christina Reed, and Brian McClear remind us that sometimes what is juxtaposed is our highest ideals as a society— justice, equality, freedom of expression—and the actual lived reality for many of us. It is my hope that these works, ‘placed side by side’ not only “creates an interesting effect,” as in the dictionary definition of ‘to juxtapose,’ but also provides an entry into the complex, challenging, thoughtful (and thought provoking) narratives that each work brings out through its own juxtaposition, as well as through being placed in context with each other. The dictionary definition of ‘to juxtapose’ belies the incredible depth of knowledge and understanding that can arise from two things placed side by side. The works in this exhibition redefine this simple action into one far more significant.